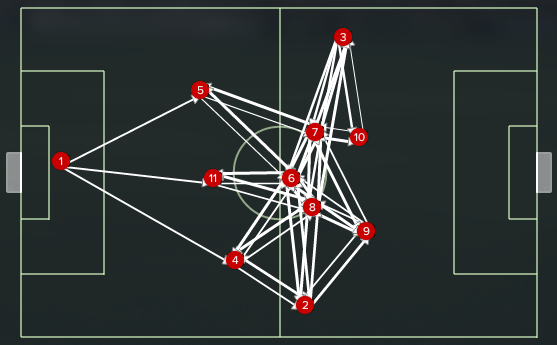 Yet another guest post by Ö-zil to the Arsenal!, an SI forum member that has produced some excellent material on tactics and club strategy over the last year or so. His articles are top quality and I highly recommend taking a look at his previous stuff – Threads. Make sure you support him on GoFundMe page – Football Manager Tactical Analysis for more excellent tactical analysis. Welcome to my first foray into Lower League Management. 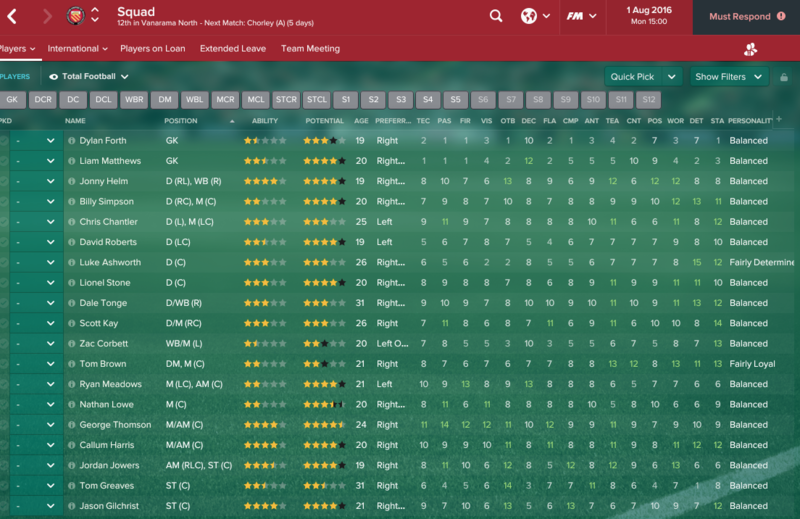 Recent threads have focused on using the Tactics Creator in Football Manager to recreate some of the most entertaining & iconic football teams of all time. The latest combined Messi, Iniesta, Neymar, Dybala, Suarez and Dybala into a system that – in my current view – is a culmination of the playing style I have been trying to create and played the best football I have seen. The beauty – in my opinion – of this style of play is that you give intelligent, technical players the freedom to go out and play, within a framework designed to get the best out of them. But what happens when your squad doesn’t have – any, or all of – the intelligence to thrive with such a high level of freedom, the technical ability to play a high-tempo passing game, the fitness to press intensely or the pace to compensate for a high-block defence? In this thread, we are going to tackle the single most common topic of discussion throughout the entire series. Playing simple, attractive, possession-focused football with normal players, not yet at a level capable of playing quick passing football, with freedom and intense pressing. Wanted to play in a league system where we can ultimately compete at a high level and that I have – at least, some – basic knowledge of, so I chose to start in the lowest playable division in England: Vanarama National League North / South. The biggest challenge of lower league football – for me, personally – is relating to the club I manage. Having mainly played clubs right at the top of the game, a fan-owned club formed out of frustrations with excesses of top-level football seemed perfect. Hello, Red Rebels. We will be referring to some of the ideas discussed in Playing Style & Structure so if you have yet to read, I would recommend reading at least the overview. Develop players using the club’s own youth system. Play a positive short-passing, possession-focused game. Not possession for the sake of possession. Triangles & diamonds facilitating a passing game. Build up from the back. 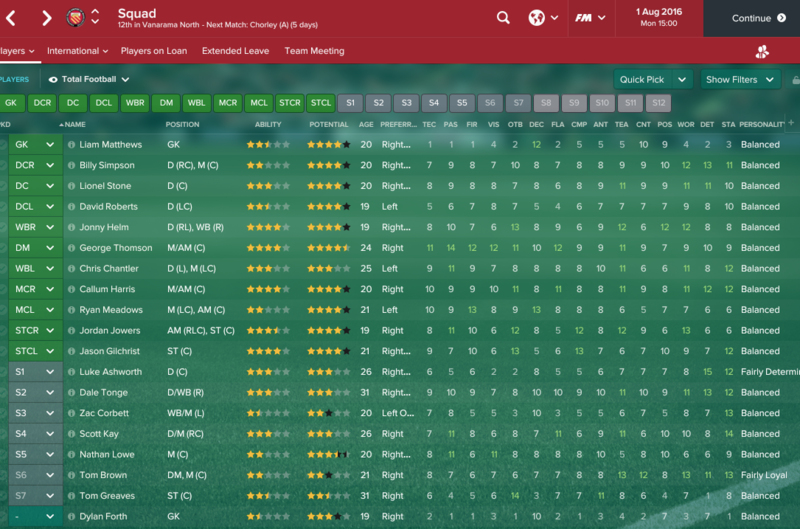 Build a young squad with potential to improve and stay together for a number of years. Coach effective Player Traits which fit the overall system. Coach players to play in other suitable positions to build complete players and tactical flexibility. 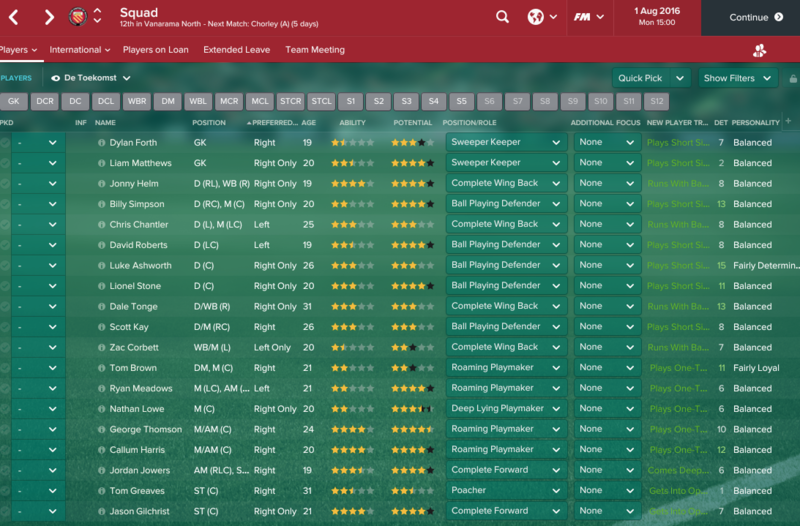 Invest profits back into the club, particularly the Academy and Training Facilities. Achieve Professional status as quickly as possible. Supplement young squad with more experienced tutors to improve Professionalism and Determination within the squad. Maintain focus on youth and positive, attractive football. 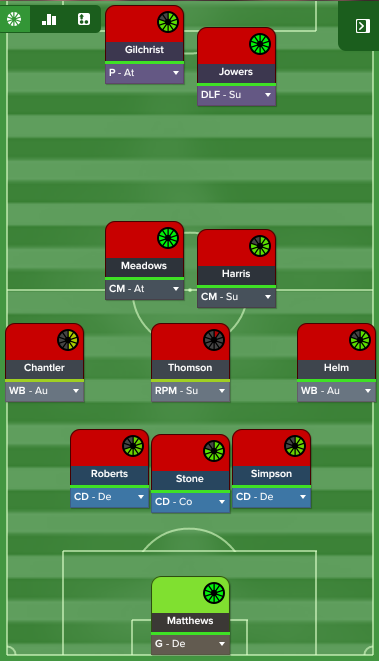 As you’d expect at this level, the starting squad left quite a lot to be desired so underwent a major overhaul to give us a platform to build from. 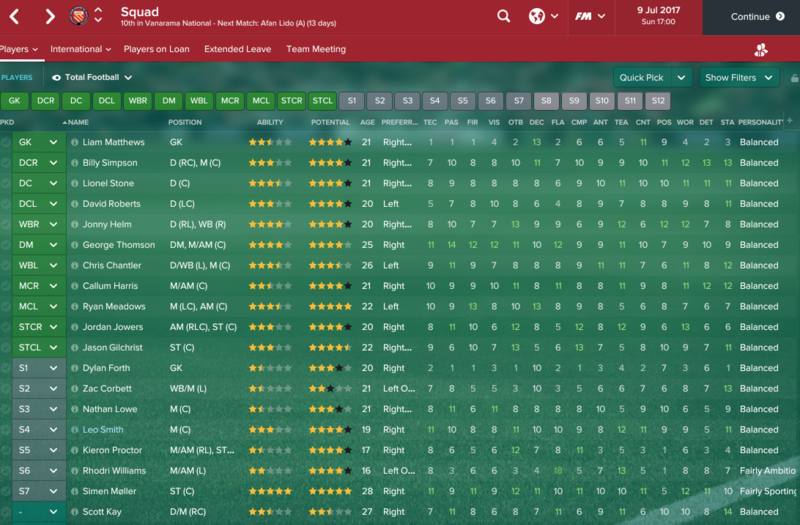 With no experience at this level, my search was fairly minimal but the trial day and free transfer market proved to be a great source of young players with relatively high potential and an upgrade on the existing squad technically. Relatively strong technical ability, intelligence and fitness. Relatively high potential to improve as we progress. Work rate and stamina not high enough for an intense pressing game. Conversely we don’t have strong defensive traits – marking, positioning, anticipation, concentration – to sit deep and keep out quality opponents. Pass and move. The foundation of the type of football we are looking to play. One of the more enjoyable facets of playing at this level is that – whilst players are unlikely to ever compete at the highest levels – it’s satisfying to work with a player and see them improve as a footballer. Training is focused on building footballers with good all-round ability. Aiming for double figures for key technical and mental attributes. Attackers & wide players working on movement patterns. As we have already identified in previous threads – formations are neutral; it is their application that gives then positive of negative qualities (Jonathan Wilson). Facilitates our game plan of playing simple, passing football. Performs well against opposition formations we are likely to face. Most of the opposing teams at this level line up in a 4-4-2 formation. Suits the players we have available. Particularly offering a strong defensive structure, to mitigate defensive weaknesses in the squad. 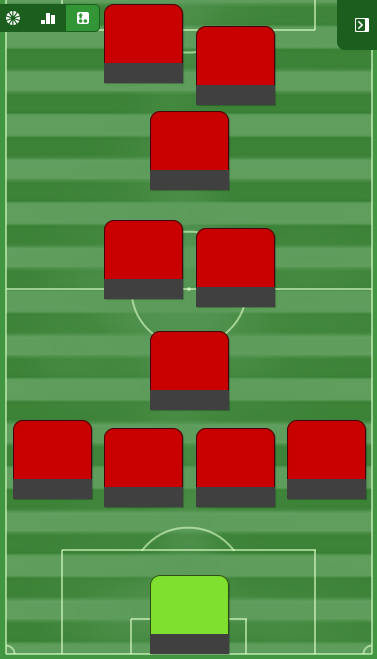 When you’re talking about possession football, my go-to formation is typically some variation of 4-3-3 as a starting point. The strength of 4-3-3 is the midfield triangle facilitating passing football. At this level, the challenge – in my opinion – is the striker role. Boiled down to it’s simplest level, football is about scoring more goals than the opposition. A 4-3-3 gives us a lone striker so you have a tough decision as to whether to set this striker to an Attack role – where his priority will be goalscoring, but is easily isolated – or a Support role – where he will contribute more to build up play but offer less of a goalscoring threat. At the top level, I am never too concerned. Firstly, high level teams generally have goalscoring threats across the team and a good striker can perform both link-up play and goalscoring. At this level, only my striker has a finishing attribute in double-figures so I cannot rely on goals coming from elsewhere and – as an underdog – I don’t want to be wasting chances. I also don’t want him isolated so I’m going to go for a strike-partnership to link up play. An alternative, which offers both a strike-partnership and facilitates possession football is the Diamond and it’s variants – 4-1-3-2 or 4-3-1-2. I love the simplicity of the diamond formation. Remember being coached to play it as a kid. The diamond shape creates a lot of triangles so most of the time you’ll naturally have a good passing option. When you receive the ball, look to make a pass to the more advanced players in the diamond. If you can’t find a player ahead, look to your side then pass inside or backwards and circulate possession. The diamond is very close to the way I would like to play, but there are two things I would change for my system. The advanced midfielder and withdrawn striker are performing a very similar role so perhaps redundant or could be better used elsewhere. In my opinion, build-up play is one of the most interesting topics of discussion around tactics. 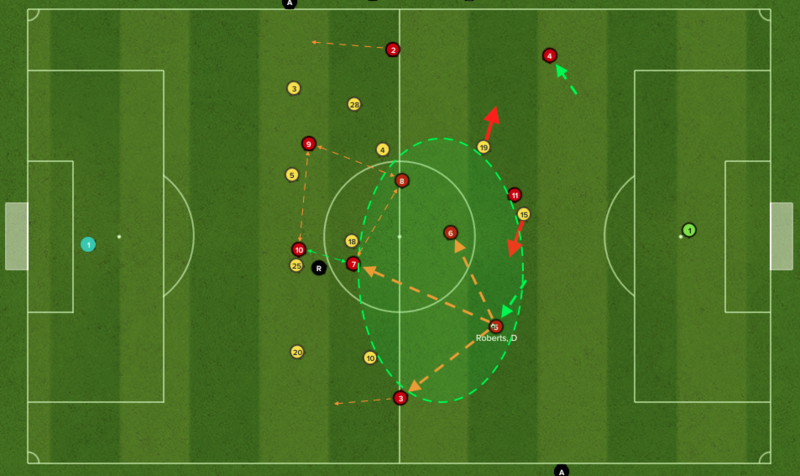 My most effective build up play has come using the concept of la Salida Lavolpiana – essentially the centre-backs fanning out wide and a midfielder dropping into the space to avoid the opposition pressing and circulate possession effectively. Use a DMC with the Half-Back role. – The challenge with the Half-Back role is that – due to a glitch in the match engine – our fullbacks must be advanced, else my central defenders won’t spread wide. The obvious issue with this is that it asks a tremendous amount from your defenders. Not only are they being asked to initiate build-up play with the ball at their feet, they are also being asked to defend as a 2-man defence. My verdict on this would be close to suicide considering a) the quality of players at my disposal and b) the 2v2 created by the opposition 4-4-2. – In addition to aiding build-up play, adding a 3-man defence gives us the benefit of 3v2 in against the opposition attackers and it suits my players. Solid 3-man defence creating a 3v2 against opposition attackers. Key player – George Thompson – sitting ahead of the defence in a playmaker role, sitting between the lines of an opposition 4-4-2. As possession funnels through Thompson the Wing Backs give him wide options and the midfielders give options ahead of him. 3v2 in midfield against an opposition 4-4-2. Thompson either has time and space, or is pressed which opens up a team mate. Withdrawn striker training to come deep for the ball and link-up to create a diamond and particularly link up with the advancing MC(A) to his left. Fluid front 4 with a simple goalscorer spearheading the attack. This is the moment readers are expecting me to say, “Very Fluid” and go on another rant. Not this time. Individual mentality distribution, in relation to Team Mentality. High creative freedom creates beautiful football when you take players with technical ability and intelligence and give them the freedom to play. The issue is that if you look at the key attributes of our squad, particularly intelligence – vision, decision making, anticipation – the majority are actually single figure attributes. A common reaction to this may be to swing to the other extreme and play a Structured shape, reducing creative freedom to a point where we are essentially giving them an NFL style playbook and minimising free decision making but this simply isn’t how I want to play. When looking at anything with a sliding scale – mentality, tempo, creative freedom etc. – another idea I find beneficial is the concept of ‘neutral’. For example, whilst Highly Structured is at the opposite end of the scale, I see that as a swing from one extreme to another whereas I see Flexible as ‘neutral’ and likely to be the easiest to play. Starting with a flexible team shape gives us a balance between the way we want to play and the way players are capable of playing, at this moment of time. Given the young squad and their potential to improve it’ll be interesting to experiment, increasing to Fluid and … dare I say it? … Very Fluid as their footballing intelligence improves. Now remember that my playmaker is a Roaming Playmaker in the DM strata so he is actually in the lower band of mentalities. It’s only a marginal difference but I do need to account for this in team mentality to avoid my playmaker playing with a more conservative mentality. This ensures that our Roaming Playmaker is a neutral mentality, meaning that he will choose the best passing option available without being swayed by a bias towards conservatism or attack. The structure and midfield runners ahead of him should encourage a positive circulation of possession. Neutral wingbacks and DM playmaker. My only remaining concern is whether the team has the technical ability to play the higher tempo associated with the Control mentality. Structure that facilitates build-up play, passing football and a simple goalscoring threat. Neutral tempo and creative freedom allowing players to play at a level they’re capable of. Positive, yet balanced mentality structure. Technical ability – technique, passing, first touch, two footedness, traits etc. As technical ability improves players will be comfortable playing a quicker tempo and more expansive game. Intelligence – vision, decisions, anticipation, concentration etc. Intelligence will dictate when they are ready to be given more creative freedom to make decisions in a more Fluid team shape. Expected to develop over time through increased game-time. Determines when we can start pressing more intensely. Most difficult to develop work-rate, may need to use specific intensive training programs. Increased creative freedom to make decisions. Hence the need for intelligence. Individual mentalities converge towards the Team Mentality i.e defenders become more expansive and attackers more involved with build up play. In the event that the second effect causes issues – i.e defenders not ready and making mistakes or strikers stopping scoring due to increased responsibility – we can consider using Standard mentality to help adapt to a more Fluid team shape. In real football terms this would be allowing players to play with greater freedom but slowing things down a bit to help the transition, before building up to quicker play. -> Fluid & Standard – increased freedom, same mentality structure and slightly slower. -> Fluid & Control – pushes up mentality for more expansive play and quicker tempo. -> Very Fluid & Standard – increased freedom, same mentality structure and slightly slower. -> Very Fluid & Control – pushes up mentality for more expansive play and quicker tempo. 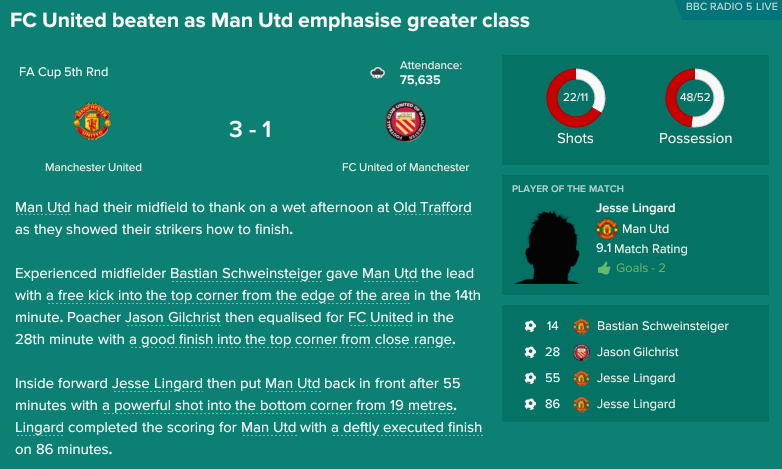 Whilst holding our own in an FA Cup tie against a Manchester United featuring the likes of Rooney, Rashford, Lingard, Young and Schweinsteiger at Old Trafford was the closest I have been – in Football Manager 2017 – to throwing on a suit and tie for the match I am going to talk about a more typical match to demonstrate the approach. 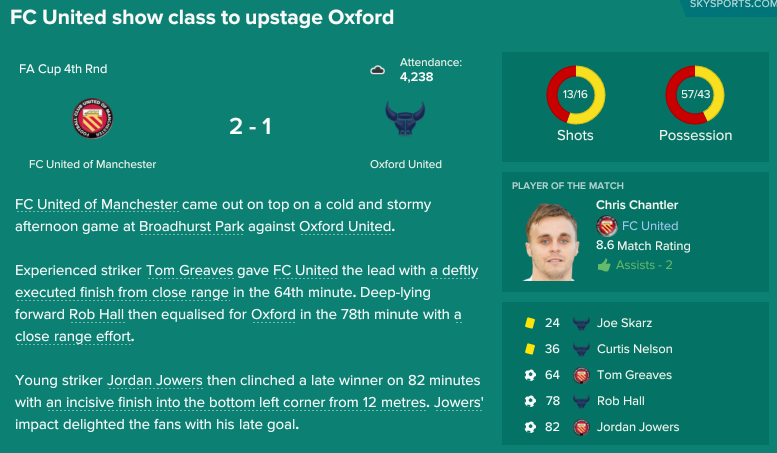 Earlier in the FA Cup run, we faced Oxford United which – whilst still not typical – was probably our most impressive performance of the season and was perhaps the highest level which we are currently able to compete. 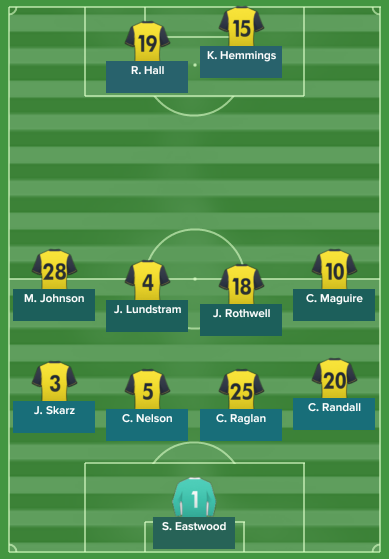 Oxford United lined up in a 4-4-2 formation which – as we hypothesised earlier – was the most common formation we faced. Against a 4-4-2 we sacrifice pressure on the opposition full backs in exchange for an extra man in defence, and midfield. Our defensive set up is simple. We don’t have the work rate or stamina to press and we don’t have the all-round defensive ability to sit deep and withstand pressure so the plan is to use an upper-medium block and a solid defensive structure to force opposition attacks out wide and outnumber them in the centre. 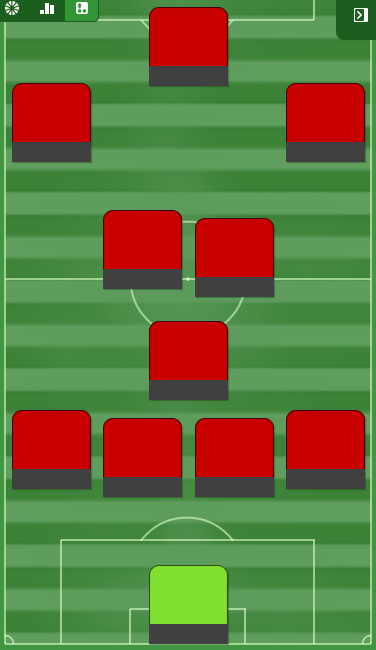 Average position without the ball reflects our starting formation almost exactly. The combination of the 4-4-2 naturally attacking the flanks and my own structure naturally forcing attacks onto the flanks makes this a common scenario. 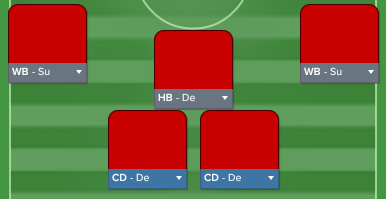 Wing backs drop deep, creating a 5-3-2 defensive shape. Our defenders have a 3v2 advantage against the opposition strikers. We also have a 3v2 advantage in central midfield. Midfield trio swings across with the widest midfielder supporting with wing back. Against a 4-4-2 the opposition midfield rarely provides too much threat, typically consisting of one defensive and one support player. Strikers make minor contributions defensively, sometimes disrupting opposition build up but generally staying forward offering a counter-attacking threat. In another similar attack the wingback comes forward to pressure the opposition attacker and we see a natural pendulum effect as the defence take advantage of the extra man in defence and midfield, freeing them to shift across and cover. 2v2 against the opposition midfield but only really one runner to track. 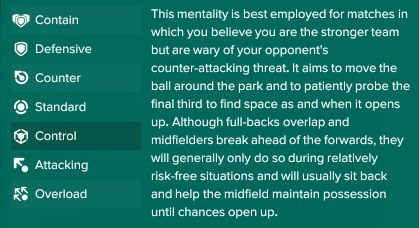 Big flaw in the opposition AI is how regularly the opposition fullbacks fail to get forward to support an attack leaving their team mates totally outnumbered. Looking at the passing combinations shows a good representation of our passing play. Goalkeeper distributes the ball short to one of the 3 defenders. Defenders generally have good passing options ahead of them so there is minimal passing between the defenders. Majority of the play goes through the midfield. George Thompson is the heartbeat of the team as playmaker. Advanced midfielders and strikers create a reasonably fluid attacking unit, linking up well. Very typical build up play here, the goalkeeper has played a short pass to the left sided centre back. 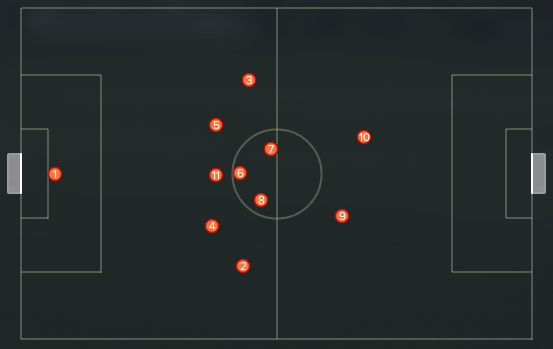 Centre backs have spread out wide, rendering the opposition press completely useless. Roberts has 3 simple passing options ahead of him or can advance to the halfway line completely unchallenged. As a left-footed player, the easiest pass would be one of the inside options towards central midfield. Green circle illustrates the acres of space between the opposition lines for our playmaker. Advanced midfielders and attackers link to provide a fluid diamond shape, giving options to advance the attack. Since day one, it’s been clear that George Thompson is the stand out player of the squad. Assigning him as the team’s playmaker and positioning him between the lines of the opposition formation was a move to give him a platform to play his best football. In this case Thompson is advancing with the ball, preparing to initiate an attacking move. Green circle illustrates the space available to him which – as a Roaming Playmaker moving into the channels – he can take full advantage of. 3 simple, advanced passing options ahead of him. Alternatively, he can advance with the ball and draw out the opposition midfield and create space for a more advanced player. 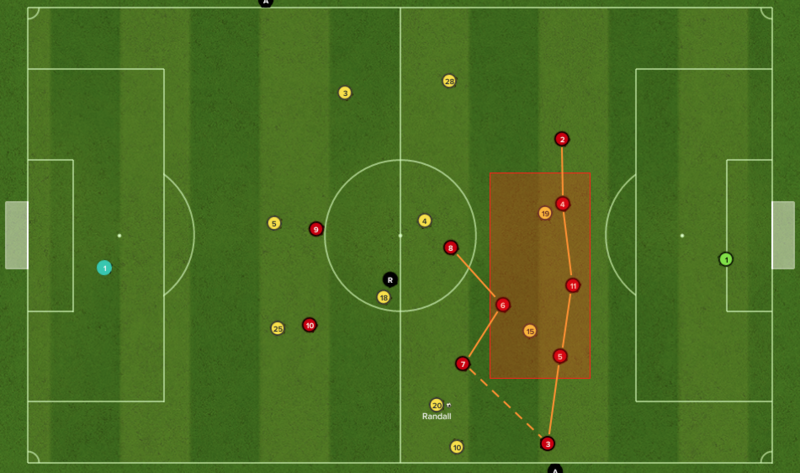 As before – wing backs provide width and advanced midfielders link with the attackers. 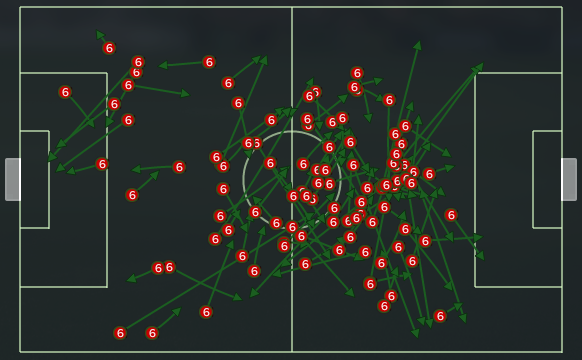 Thompson hit 99 successful passes in this game and – as you can see – controlled game from all over the field. No surprise that he was also the most accurate passer in the league. The real advantage of this build up is not only that it is controlled, but it is also efficient. The ball does not spend long at the back. Within one or two passes we’re into the attacking phase. 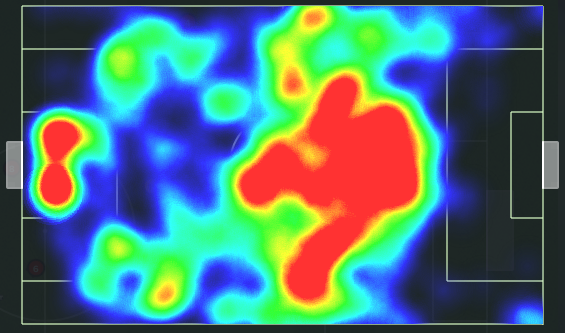 This is illustrated perfectly in the possession heatmap. What a perfect platform to build from. Advanced midfielders and forwards combine creating a fluid diamond shape. Jowers drops off deep, drawing the defender and creating space for – in this case – Greaves to attack. Wing backs provide width and stretch the opposition defence. Attacking runs from midfield can create a 3v2 overload against opposition defenders if the holding midfielder fails to track. When we can’t attack centrally, we can threaten from wide. Strikers have a 2v2 against the opposition centre backs in the box. 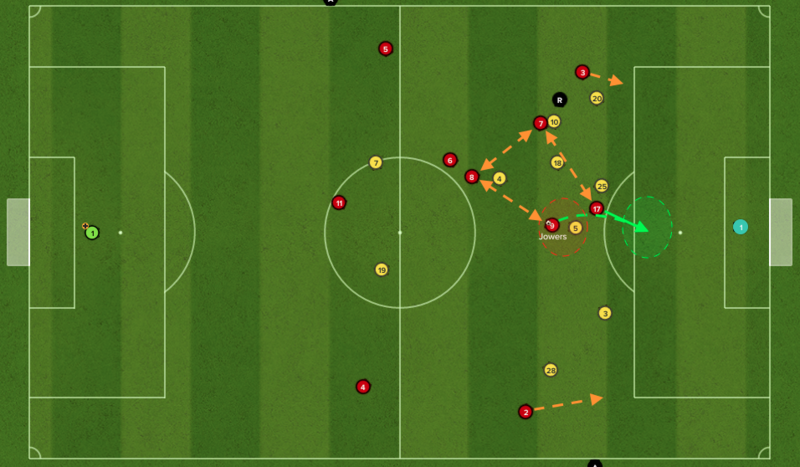 Playmaker still in a lot of space to recycle possession should the attack break down. Comfortable win. More than held our own against a side who are the best part of 3 leagues ahead of us. We won the league with relative ease and enjoyed two great cup runs. Our primary objective is to achieve professional status which I am hoping to secure around the end of the second season. Adapting to playing at a higher level after promotion is always a challenge but we can be optimistic, judging the results against higher-level opponents during the cup run so we extend contracts for almost the entire team and look to supplement the squad with a few attacking options. Whilst players have benefited from a modest progression in ability, they are still lacking the intelligence and technical ability to progress the playing style to the next level. 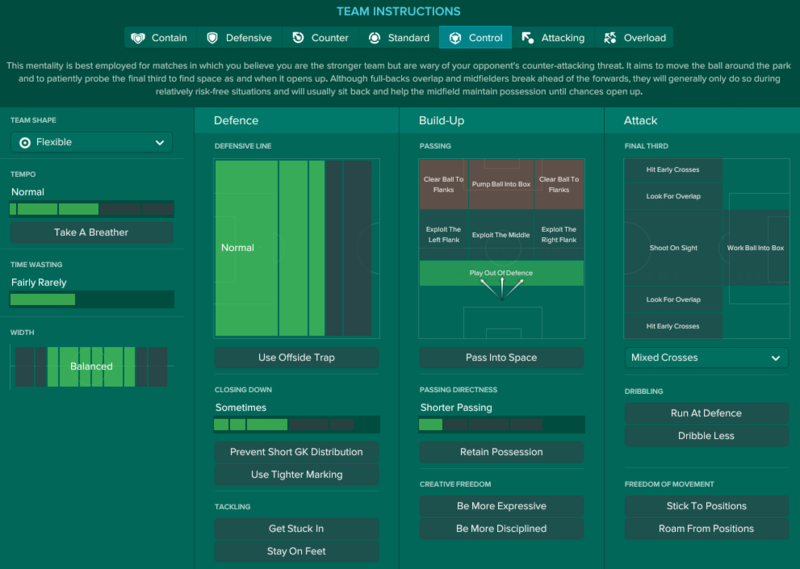 But I will be looking to developing an alternative structure using a 4-man defence as we start to face more tactically sophisticated opponents, but that’s another story for another day..
Wasn’t a huge uptake last time but if you’d like to contribute towards the continuation of these articles and the time & effort that goes into them here’s the GoFundMe page – Football Manager Tactical Analysis. I’d like to be 100% clear that these articles are completely free and will always continue to be. Contributions are simply supporting the work that’s been done so far, if you’ve enjoyed them. As I am sure you can appreciate – whilst I love writing them – a lot of time & effort goes into these. Hope you’ve enjoyed reading and find some of this useful. Will be very interested in hearing your solutions to playing quality football at a lower level. Different format this time round so let’s see if this generates some interesting discussions! I noticed what you said regarding the half-back on the latest iteration of the match engine. 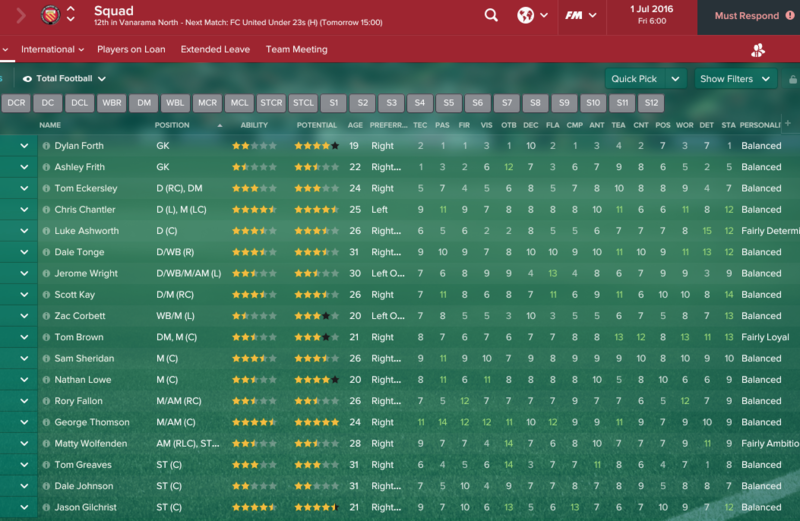 Recently, whilst managing Sporting and using William Carvalho and Diego Braganca, I’ve used a half-back. But they’re a DLP [D]. All I did was instruct the ‘keeper to pass it out to the DM. It makes them naturally fall back into the defensive strata and weirdly, they’ve stayed there. Braganaca, at 17, has averaged 7.34 there in his first season – I’ve always found high ratings for DM’s notoriously difficult. I may write a piece on it, but it’s something you could explore as an option! I like this meticulous choose of settings, to balance the system….. But….. What do you do when things aren’t going in your plan, example; 1 goal down, man down, AI attacking after a lead? I would know how you approach changes?